Its raining and miserably windy outside so I am staying in the craft cave when I can. I need to put together some masculine birthday cards for the month of October desperately... so I am hoping to at least get 4 completed before the beginning of the month. I am slow when it comes to making masculine cards. Its not like I do not have the stamps! So matched up the colors from CR84FN with my first set of masculine cards. Birthday cards. With combining Crumb Cake, Marina Mist & Early Espresso, this does look manly already. I am making more of these with other others popped in (like the Marina Mist) - won't that create a manly card too? 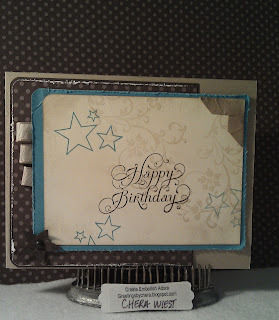 I like the distressed edges and super stamped images. Lovely! Thanks so much for playing along with CR84FN this week! This is a great masculine card, love the little tabs on the side. Terrific masculine Birthday card! 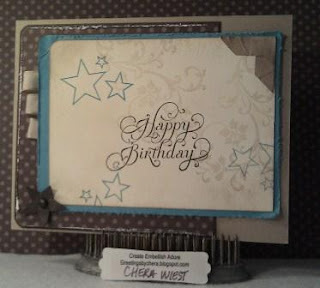 Love the distressed edges! Chera, GREAT masculine card! LOVE the stars and the corner and the distressed edges! THX for playing with us at CR84FN!